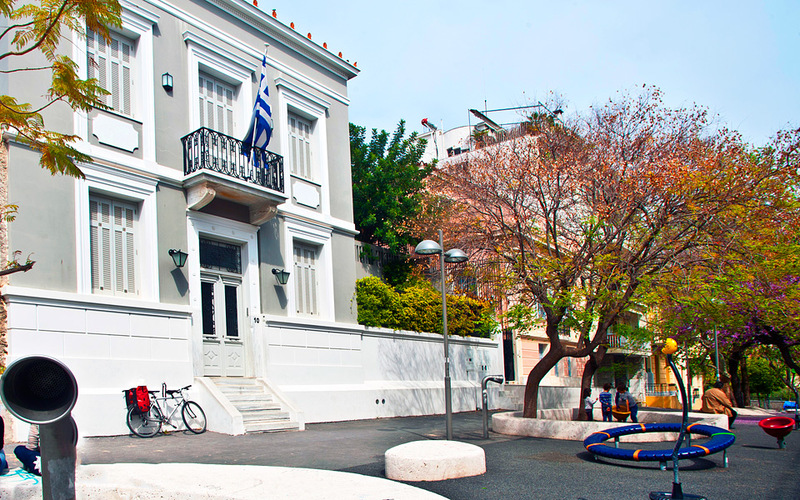 A buzzy and popular area year-round because of its stunning world-famous monument and museum, the Acropolis/Makryianni district is like no other Athenian neighborhood. It’s a fantastic place to escape if you feel the need for a genuine change of scene from the somewhat frenzied pace and gritty urban landscape in other parts of the capital. 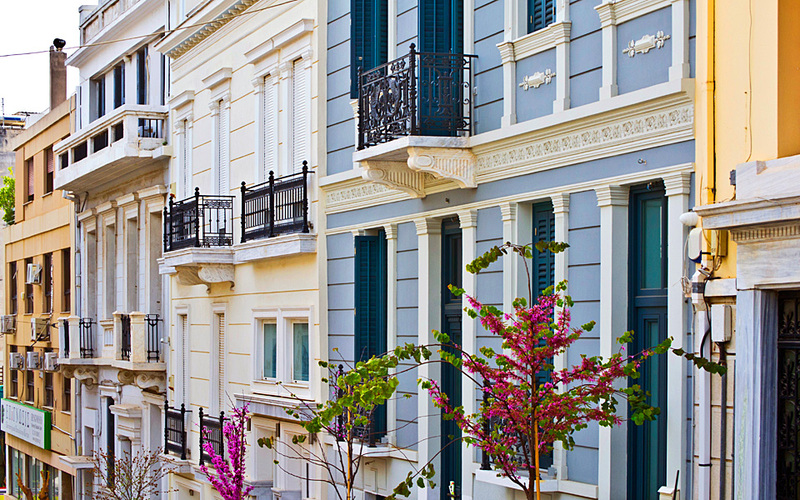 The wide, paved and elegant Dionysiou Areopagitou Street, which is lined by noble and unique neoclassical buildings on one side and robed in abundant greenery and open sky views on the other, gives rise to a sense of openness and ease. As you wander deeper into the area’s streets, many of them named after Greece’s most famous revolutionary heroes or ancient Acropolis monuments, you’ll soon discover that, apart from a scattered bunch of humdrum souvenir shops, there are some charming and stylish little stores, quality cafés, cultural hotspots, beautiful architecture and other quirky features to admire, many of them revealing how this neighborhood is developing a new sense of trendy cool, just like its increasingly popular neighboring district of Koukaki. 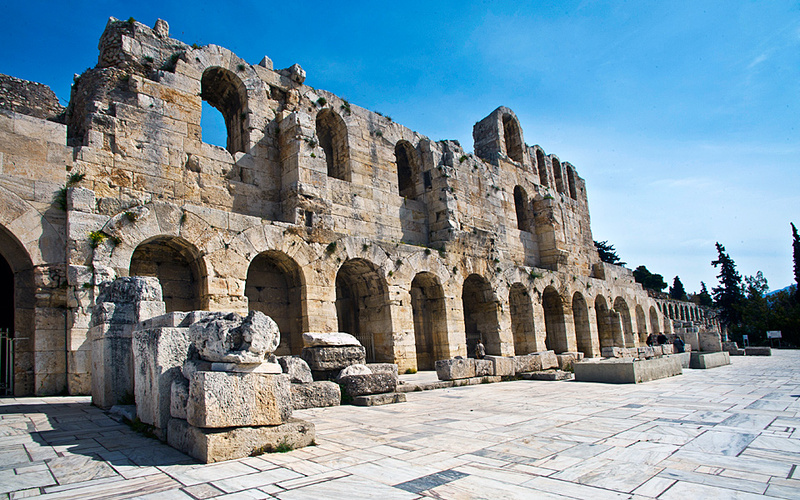 The ancient Odeon of Herodes Atticus theater. Unsurprisingly the area is very touristy. Yet its outstanding aesthetic identity manages to shine through regardless of how many crowds of visitors, street musicians, dodgy mimes, Segway tourists or laughing cyclists throng its every corner, particularly on weekends. The majestic temple of the Parthenon towers overhead, gleamingly solitary, a sight one can never tire from, regardless of the angle. The ancient Odeon of Herodes Atticus theater sits below, coming vibrantly to life on summer evenings when it hosts world-renowned performers and gathers adoring crowds of culture vultures. The theater is also alluring during winter, when neighborhood children play in its huge courtyard during the day, or when the rain makes its marble floors reflect the stunning edifice like a mirror. Replicas of the Parthenon Frieze can be seen inside the Acropolis metro station. 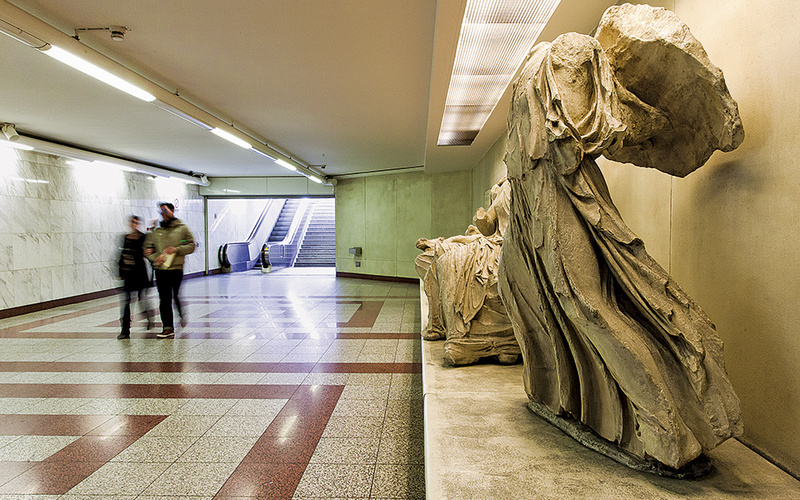 More than 50,000 ancient artifacts were unearthed during the construction of the metro from 1993 to 2000, and some of these are showcased in Acropolis metro station. Replicas of the Parthenon Frieze, themed on the Panathenaic Procession (a festival in tribute to Goddess Athena) can be seen along the walls of the platforms. A small exhibition presenting ancient olive oil and wine vessels, toys, a loom and vases can be viewed from the main escalators, while toward the station’s Dionysiou Areopagitou/Makryianni exit are replicas of the Parthenon’s east pediment, depicting mythological scenes such as the birth of Athena from Zeus’ head. The station also features a giant photograph of actress and former culture minister Melina Mercouri, honored here because she was the first Greek politician to pursue the (ongoing, though somewhat sleepy) campaign for the return of the Parthenon Marbles, taken from Greece by Lord Elgin and housed in the British Museum. Stepping out onto pedestrianized Makryianni St, you’ll see a dense strip of restaurants and cafés to your left with a few clothes and jewelry stores in between. Most of the cafés serve quality coffee, providing an easy and pleasant stop-over either upon arriving or just before you jump back onto the metro: Leonidas serves an affordable, good quality cup of coffee and a tasty choice of chocolates, Elaia is a nice hangout with good service and ice cream, Ice Queen serves delicious vegan gelato, while Makryianni 33 is known for its mouthwatering Loukoumades. Well-prepared Mediterranean dishes are also on offer: Athinai Bistrot at the very top of the strip is the ideal place for elegant nibbles and people-watching on a sunny day while, further down, Yard is the spot for a Μediterranean style meal and wine. For Greek food, God’s Restaurant, with its outdoor video screening of its “famous” chef at work, never fails to draw the tourists for some charcoal-grilled octopus and other Greek specialties. However, if you’re willing to walk just a little further, you’re likely to be a lot more satisfied by the choice, charm and experience. Right at the end of the strip, on the corner of Makryianni with Hatzichristou is Terra Carpo (No. 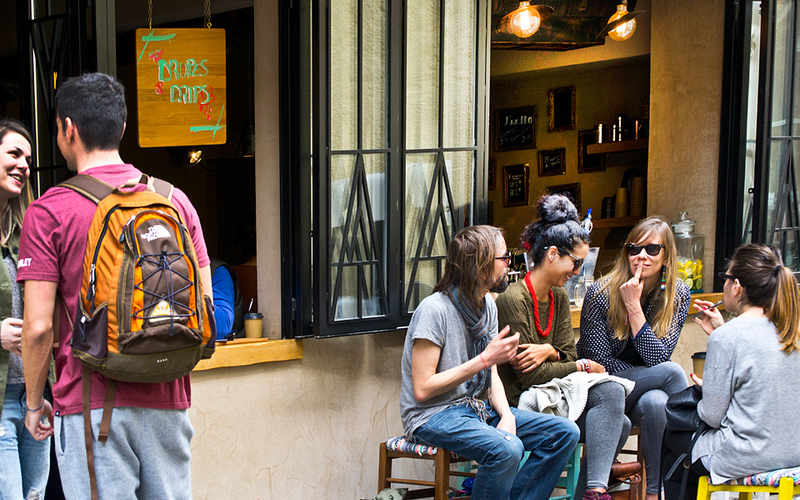 13), where you can sip probably the best coffee in that area, and also buy a good variety of freshly handmade health bars with oats, quinoa, peanut butter, seeds and berries, or a selection of dried fruits and nuts, as well as some freshly ground coffees and fresh chocolate bars. A little further down, just behind the museum, is Ellinika Kaloudia (8 Hatzichristou St), an excellent deli selling, as its name suggests, Greek delights sourced from small, individual producers around the country, usually those following organic and ethical farming methods that the owner has sought out personally. From rare fresh and aged cheeses and quality preserved meats and cold cuts, sausages, hand-picked teas, a range of pulses, flour and fresh pastas to essential oils, cosmetics, and eco-friendly household products, the store offers a plethora of high quality products at decent prices. Ellinika Kaloudia is an excellent deli selling Greek delights sourced from small, individual producers around the country. 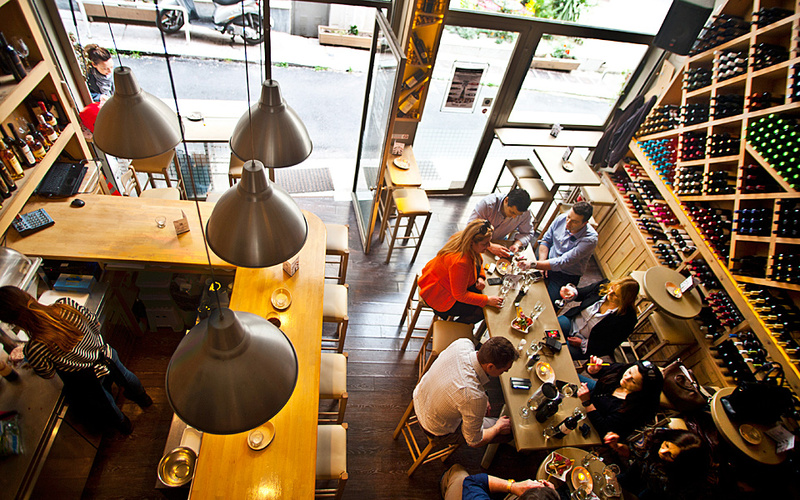 Winepoint offers a broad and beautiful selection of Greek wines and Mediterranean gourmet-style meze dishes. The Eleni Marneri Gallery features creations by almost 40 Greek and foreign designers. Around the middle of Makryianni St is the start of Athanasiou Diakou St, and turning right from there is Porinou, a petite road that has become quite a nightlife hub over the last few years. Here you will find Winepoint, with its broad and beautiful selection of Greek wines accompanied by Mediterranean gourmet-style meze dishes. At the wittily named Hitchcocktales is next door, inspired by the great director Alfred Hitchcock’s play between terrifying darkness and cutting humor, you can enjoy creative, well-mixed cocktails and quality wine. Across the road is an established neighborhood hangout, the Italian cuisine-inspired Aglio, Olio e Pepperoncino, favored by local saveurs, personalities and visitors with a wandering spirit. On the corner of Porinou and Lebesi is the gallery/shop Christina Skouloudi Design Studio (No. 9), which presents the utilitarian and decorative creations of industrial designer Christina Skouloudi. Here you can find completely original designs such as multicolored “lace” organza scarves, wooden bracelets, wool soap, felt bowls, bottle coolers, key chains and perforated steel sheet trays and plates for fruits and other items. 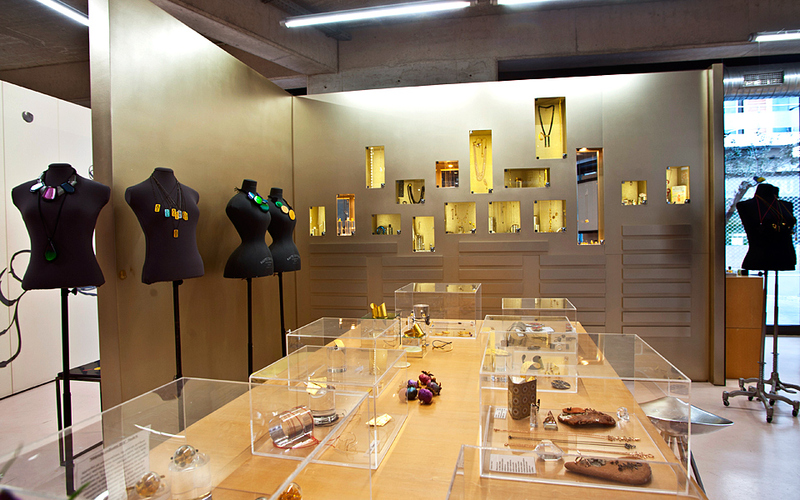 Right next door is the Eleni Marneri Galerie (7 Lebessi), which is the country’s only contemporary jewelry museum, featuring creations by almost 40 Greek and foreign designers. Video art, exhibitions and creative home décor items for sale will allow you to peruse the gallery to your heart’s content. The gallery’s next exhibitions are “Blossom”, a solo exhibition by Mari Aoyama and “Antilogos” group exhibition. 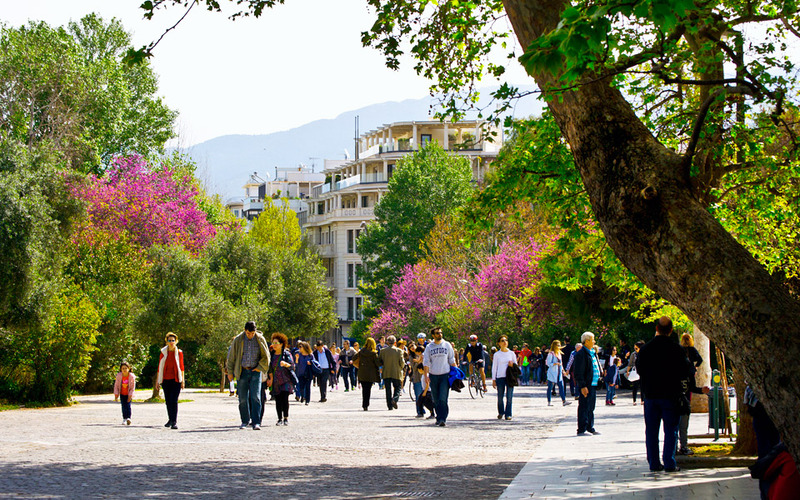 The pedestrian promenade of Dionysiou Areopagitou. The exit also brings you out on to Makryianni St, but closer to the pedestrian promenade of Dionysiou Areopagitou. At the far end of this road, where the statue immortalizing Melina Mercouri faces the busy Syngrou Avenue and the Temple of Olympian Zeus and Hadrian’s Arch stand imperiously on the other side, you’ll find the tiny and quiet Frinichou St, which will lead you into Plaka, where you can also pause for a healthy juice at dinky Frutteria (18 Frinichou). The store has a wide selection of fresh fruits, vegetables, nut mylks and superfood powders and also provides small cups for half portions or kids. Nearby you’ll find Athens Segway Tours (Frinichou & 9 Aischinou), which offers a number of tours starting from the Acropolis area, including the National Gardens, the Olympic Tour, Food Tour and a Night Tour, that will roll you around the city centre. For a similar perambulating experience in a slightly different form, visit Scooterize (18 Hatzichristou), on the road behind the museum, which also offers various tours, including to the Athens “Riviera” on the southern coast, a choice of foodie destinations and a collection of cultural hotspots. 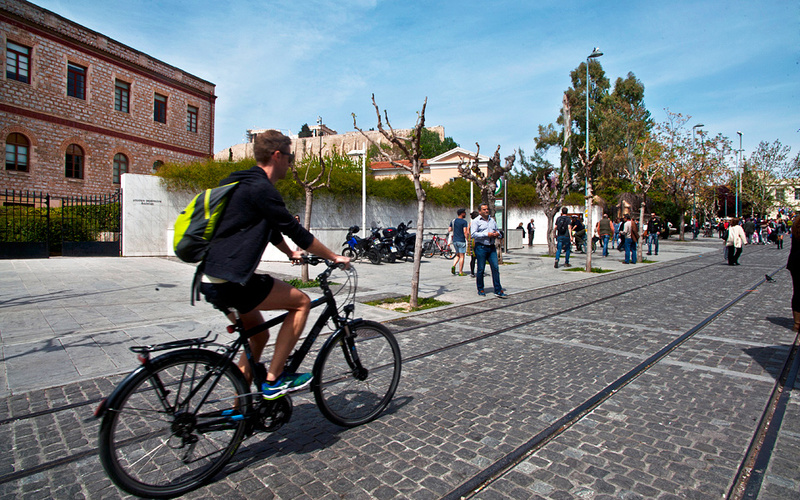 If you’d rather actually move your limbs, try Solebike for cycling tours or EcoAthens, which offers some great walking, hiking and biking tours themed on history, culture, food and wine around Athens and the wider region. A little further along Dionysiou Areopagitou, Acropolis Pharmacy is one of those fancy chemists where you can find all kinds of high-quality cosmetics, vitamins and medicinal goodies that if ordered online and then picked up at the store come with a 30–40 percent discount. On this part of the street you’ll also spot some non-descript souvenir shops and restaurants, followed by the swish designer boutique hotel AthensWas. Its modern rooftop restaurant offers a breathtaking view of the Acropolis and serves Mediterranean food (from 12:00–23:00) daily. Passing bustling Makryianni St and heading up Dionysiou Areopagitou, you can’t miss the magnificent modern architectural gem on your left, the world-famous Acropolis Museum with a total area of 25,000 sq.m. Apart from the main stairs leading down to its glass-floor entrance, through which you can look down on the ancient ruins that were unearthed here, the museum also has a beautiful garden, abundant with rosemary, lavender, sage and other Mediterranean herbs and flowers, with side entrances (one on the left-hand side of the museum, on Dionysiou Areopagitou, and the other around the middle of Mitseon St) that importantly, provide wheelchair and pushchair-friendly metal pathways. Apart from its plethora of exhibits and stunning permanent collections, the museum’s café and restaurant, which has both indoor and outdoor seating areas (the outdoors section is best as it’s in view of the Acropolis and can provide restless children with some running-around fun), serves healthy, creative and comforting Mediterranean food and Greek classics, with hot meals available daily from 12:00 to 17:00 (20:00 on weekends), while on Fridays the restaurant plays jazz music and is open until midnight. There are plenty of kid-friendly activities at the museum, including art projects and treasure hunts and also a Lego reproduction of the Acropolis built by Australian “brick man” Ryan McNaught. The 120,000-piece, 5th-century BC scene, which took over 300 hours to create, includes funny details like Elton John performing on piano and Oedipus Rex gouging out his own eyes. If you’re looking for some unique gifts for your friends (or yourself), the museum store sells art and design objects, jewelry modeled on what fashionable ancient ladies wore, prints, notepads, clothing items and much more that you won’t find anywhere else. Beautiful buildings line Karyatides St. at Koukaki. As you walk along Dionysiou Areopagitou and pass musicians, tour groups, families pushing baby strollers and bunches of friends with their dogs, stray off the beaten track by turning left down Mitseon St until you reach Takis Bakery (14 Misaraliotou), one of Athens’ most loved bread makers. The small, unassuming, yet hugely popular (among those in the know) bakery sells a superb choice of super fresh, handmade bread – from rosemary bread with thick sea salt to olive or saffron bread, to name but a few, as well as pies, sandwiches and a lovely variety of melt-in-your-mouth shortbread cookies and American-style cakes that would excite anyone who receives a box of them. Fluffy, spiced carrot cake with a thick layer of cream-cheese icing, densely chocolaty chocolate brownies, lemon sponge cake with zingy cream filling – you get the picture. Their tsoureki (a sweet bread) is also famous for its distinct, chewy-soft texture and light mastic flavor. There is always a queue in Takis, and especially on Clean Monday (the beginning of Orthodox Lent), when the line for flat lagana bread goes all the way around the block! Takis’ owners have recently opened up another place just across the bakery. Equally small and offering the same high quality, the curiously named Drupes & Dripes (20 Zitrou) is like a superhero that transforms itself from a café/juice bar to a “Chiquiteria” deli from 13:00 to 21:00 every Tuesday and Saturday, serving prosecco, raki and unpasteurized beers along with a lovely variety of Greek and international cold cuts, cheeses and, of course, breads, crackers and grissini sticks. Drupes & Dripes serves a lovely variety of Greek and international cold cuts among other things. Lotte Caffe-Bistrot stands out for its early 19th-century themed décor steeped in a quirky vintage style. On the lower corner of Misaraliotou at the start of Tzami Karatasou St is the area’s dinkiest and prettiest hang-out, neo-trendy Lotte Café-Bistrot, which is named after the heroine in Goethe’s The Sorrows of Young Werther. With an early 19th-century themed décor steeped in a quirky vintage style, delicate crockery sourced from antique shops and a classical music playlist, this is the kind of place you want to spend hours sipping tea and chatting on any rainy afternoon, or enjoy a sundown glass of wine and a hot snack at one of its minute outside tables on a spring or summer evening. The other (upper) end of Misaraliotou leads into Kavalloti St, where you’ll find another recent arrival to the neighborhood, the designer-style Greek deli Pelasgaea, created by a group of friends who claim to have traipsed far and wide through the country’s varied agricultural landscapes, turning what they love – authentic, pure, sustainably grown food from their own and friend’s farms – into a business model. 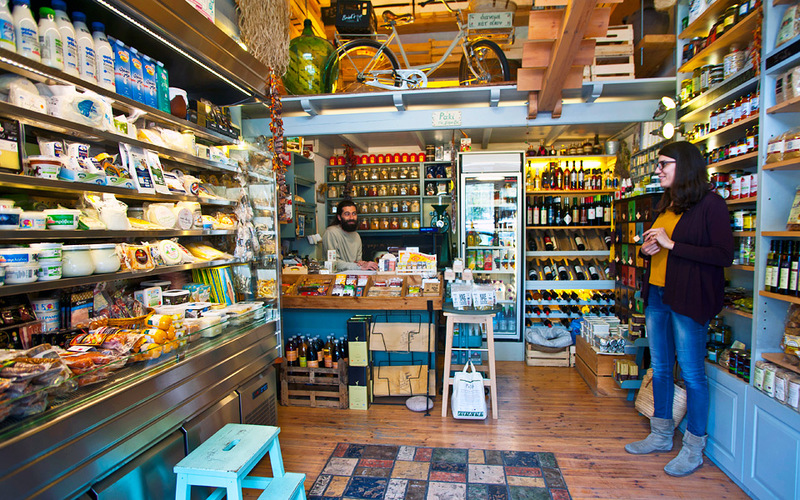 The deli sells their own brand of Anthia organic and extra virgin olive oil, balsamic vinegar and olives in tantalizing varieties, such as those stuffed with chili, sea samphire or garlic. They also have exciting dips, such as beetroot, feta and mint, or fig and walnut, made by small producers, and a choice of handmade pastas, trachanas (a type of frumenty), fir tree or thyme honey, preserves, cookies and rusks. 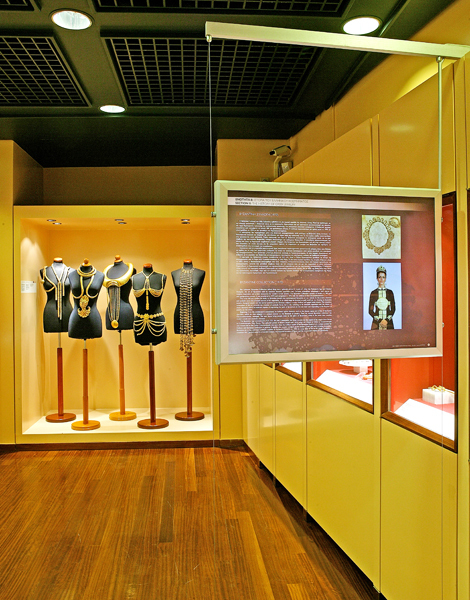 Heading up Karyatidon, which branches out from Kavalloti St, you’ll reach Kallisperi where you’ll find Athens’s prestigious Ilias Lalaounis Jewelry Museum (No. 12), which exhibits over 4,000 items designed by the museum’s founder through over 50 collections that are themed on the evolution of Greek jewelry design. 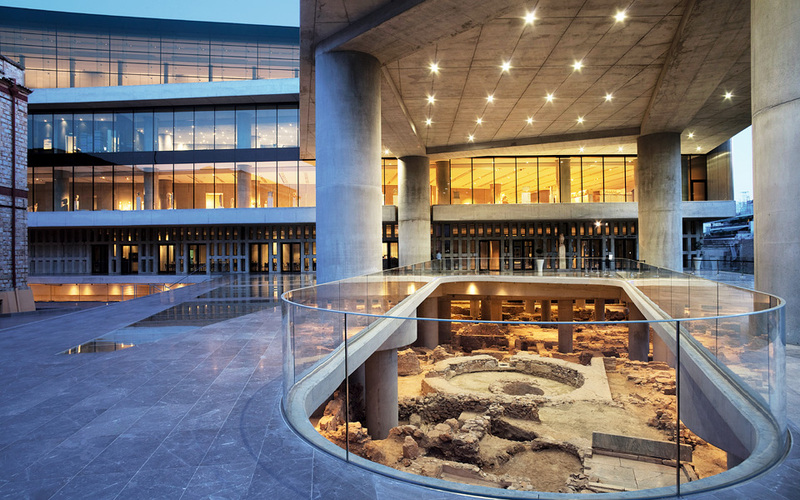 Permanent exhibitions include the Golden Dawn of Art and the History of Ancient Greek Art, as well as jewelry inspired by other civilizations, nature, space, biology and modern technology. The current temporary exhibition at the museum, titled From Zeus to Earth and From Chile to Neapolis, presents a collection of 330 fossils and minerals sourced from around the world. The museum shop sells a fine choice of jewelry, décor objects, clothes and books. which exhibits over 4,000 items designed by the museum’s founder through over 50 collections. The Six Thresholds playground is inspired by Pieter Bruegel’s 1560 painting “Children’s Games." If you are visiting with kids and need to give them a play break, head to the unique nearby playground further up Kallisperi, right outside the neighborhood’s public school. Named Six Thresholds by the architects who designed it, the playground is inspired by Pieter Bruegel’s 1560 painting “Children’s Games.” Listed in the Guardian’s “Readers on the best city improvements” in 2015, this play park includes thimble-like seat rides and a large treading wheel. As you continue on Kallisperi, housed in one of its Berlinesque buildings on your left is Swaha Yoga and Pilates Center, where one can stop for a drop-in class in Aerial, Hatha, Vinyasa or Jivamukti Yoga, as well as Pilates or a range of massage therapies. 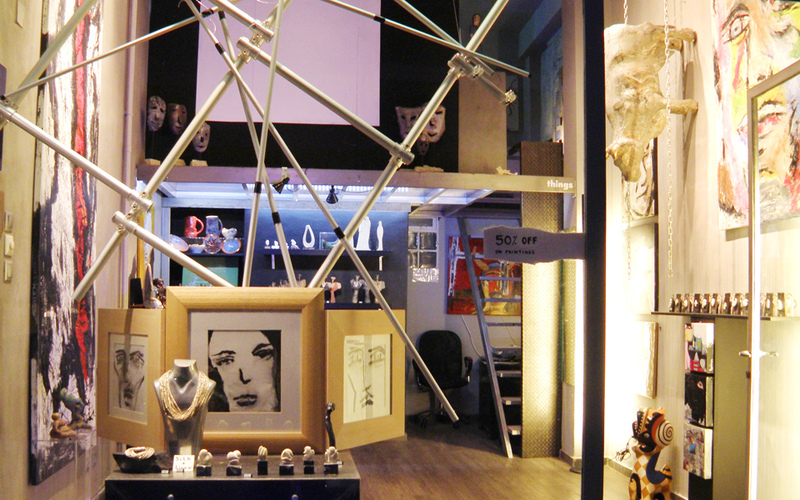 On the corner of Kallisperi and Parthenonos streets, you’ll find Athena Design Workshop (No. 30), one of the neighborhood’s coolest stores and highly representative of the new profile the Makryianni area is developing. 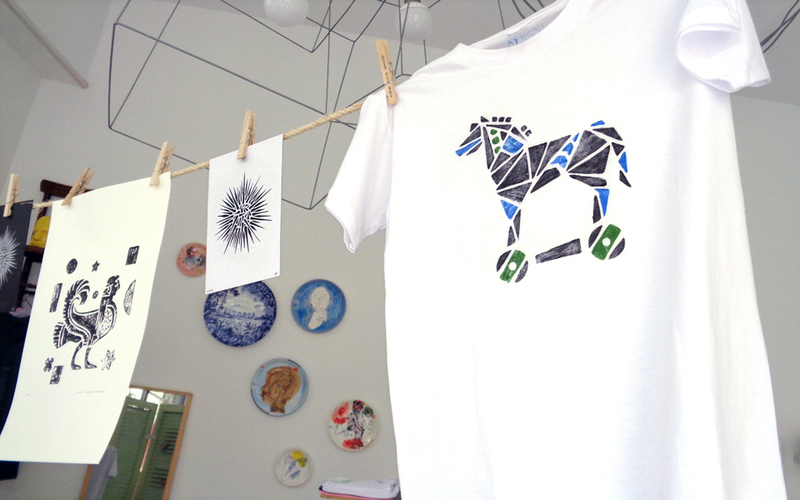 Athena is an art shop where you can buy original printed T-shirts and cloth bags, prints with traditional Greek themes, words such as agapi (love) in Greek letters or animals presented in an inventive, contemporary way. Athena’s is a gently humorous take on the surrounding classic, cheesy tourist shops, showcasing shopping options for the alternative-minded tourist (and not only) seeking Greek souvenirs or even gifts for themselves. 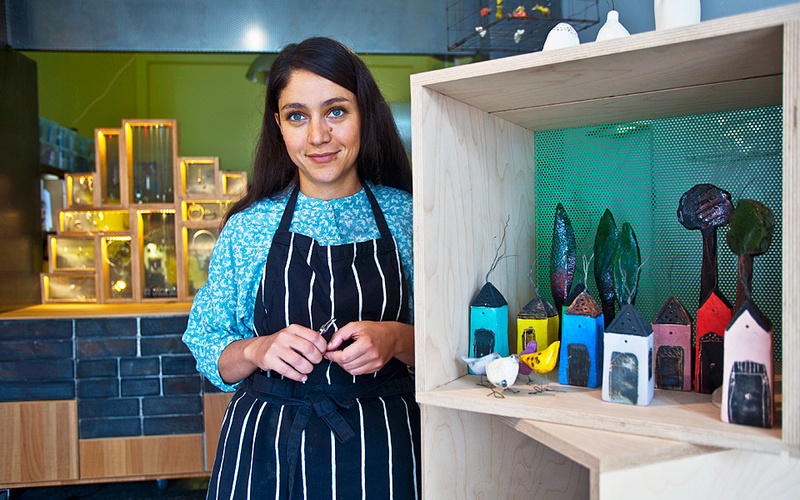 The store is owned by Krina Vronti, an Australian-raised set designer and illustrator. Her new line showcases Athens’ beloved stray dogs, inspired by Loukanikos, the world famous protest dog and his four-legged compatriots. Just a little further down on Parthenonos (28) you’ll find the flagship store Ariadni Kypri Workshop and Gallery (there are numerous outlets for Kypri’s designs around the country). Kypri’s sculptural jewelry is presented through her Circus and Ydor collections, the former featuring a variety of acrobats, some of which are movable, on rings, necklaces, bracelets, earrings, brooches and foot and hair pieces, mainly made from silver but also bronze and including the use of leather and thread. 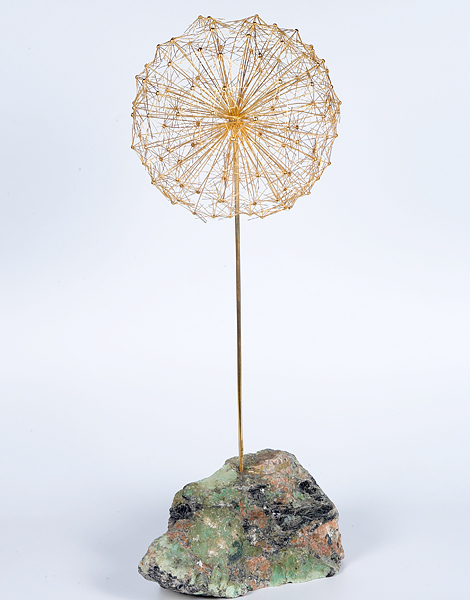 The latter takes its inspiration from the sea, and all pieces are made to include shells, starfish or sea pebbles. Contrasting with the muted colors of silver, bronze, charcoal and earth tones is the store’s bright ceramic décor hung on the walls – currently a row of flat tiles with houses painted on them, and above, suspended by ropes, a cloud and the sky, which is the work of Kypri’s mother, the potter Maria Marinoglou. The designer reveals that every season she “dresses” the store with her mother’s art. Across the street is another inviting window, bedecked with sparkling jewelry and art pieces. Art 10 Gallery (39 Parthenonos) collaborates with painters, sculptors, potters and other artists to present exhibitions, performances and narrative art, book presentations and more, while also selling singular home décor and utilitarian art objects. If you walked to the end of Kallisperi, you’ll emerge onto a junction with Rovertou Galli St (the continuation of Hatzichristou, which for some puzzling reason changes name half-way through) and right across you’ll see one of Athens’ oldest and most popular tavernas, Strofi. Being at such close proximity to the Odeon of Herodes Atticus theater (just a few minutes’ walk up Propyleon St and turn right on Dionysiou Areopagitou), the taverna, which opened in 1975, was the classic dinner spot for the medley of stars who performed at the Herodion. 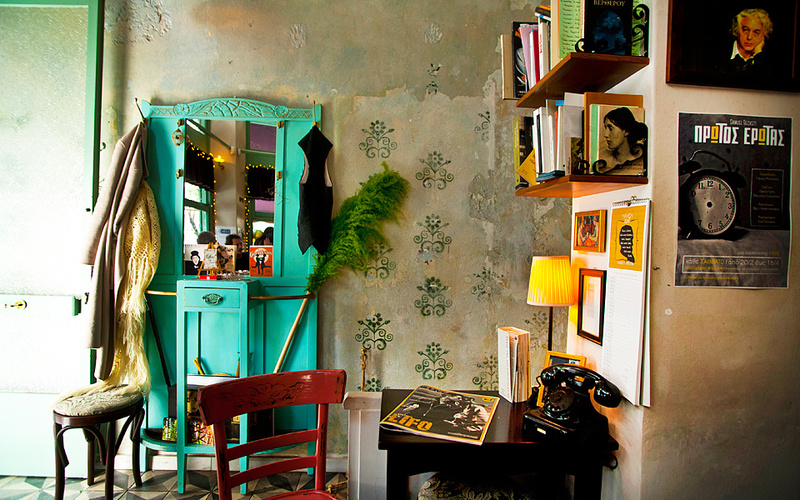 Indeed, before the restaurant’s renovation into an industrial grey, modern look just a few years ago, rustic Strofi were plastered wall to wall with signed photographs of Maria Callas, Rudolph Nureyev, Liza Minnelli, Frank Sinatra and other awesome global glitterati. The restaurant, popular mainly because it boasts an astounding view of the Parthenon, remains a celebrity magnet, serving its elegantly presented tzatziki, meatballs, grilled octopus and melted haloumi cheese to the likes of prime ministers, arts personalities as well as ordinary folk who like a good (and surprisingly, not too pricey) place to eat. 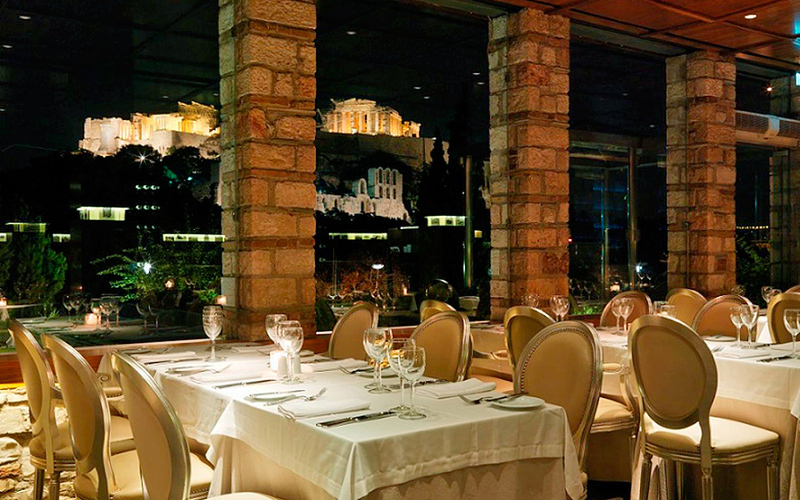 All time classic: The Dionysos Restaurant has the Acropolis and the Odeon of Herodes Atticus in full view. However popular Strofi may be, it cannot quite outshine the much larger, and much more ideally positioned Dionysos restaurant, which has the Acropolis and the Odeon of Herodes Atticus in full view from most of its dining/café area. An old-time classic that opened 50 years ago, this chic restaurant has also played host to some of the world’s most brilliant personalities on their visits to Athens. Its cuisine is based on Greek classics and prepared with a modern, gourmet take. Another restaurant with a breathtaking Parthenon view as well as a satisfying menu is Attikos Greek House on the start of the pedestrianized road that arches around the western and southern sides of the Acropolis (7 Garivaldi). In wintertime the interior is reminiscent of a garden and has a cozy fireplace, while in summer the scenic rooftop comes into full use and is busy every single day, serving traditional Greek foods with a slightly modern twist. 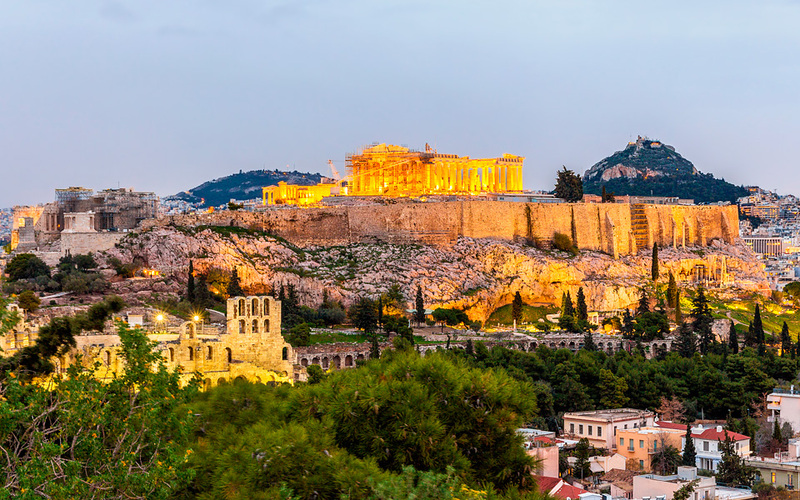 Whether you’re visiting Athens or moving here, the Acropolis area is a wonderful place to stay. Its close proximity (not more than 20 minutes’ walk) to Plaka, Monastiraki, Thiseio, the National Gardens and Syntagma Square offers the opportunity for numerous scenic walks in some of the city’s most beautiful and most interesting parts, although of course the metro here will connect you with the rest of the city, too.